A great joy of reading The Churchill Documents is their trove of historical sidelights. Volume 22 (August 1945—September 1951, due late 2018) covers the early Cold War: the “Iron Curtain,” Marshall Plan, Berlin Airlift and Korean War. It reminds us of the political battles swirling around the Anglo-American “special relationship.” Of course the issues seem very clear in hindsight. Seven decades ago, the future was unknowable. Consider Governor Dewey and the question of America’s commitment. I have hesitated for a long time about burdening you with this [but] I am taking the liberty of imposing upon you…. Mr. Hoover made a speech night before last, the implications of which are appalling to me. The press reports today it has had wide and unhappy repercussions in Great Britain and on the Continent. I am still not quite sure why I ran again [for president in 1948] but in any event, having no ambitions or expectations of having any other office I am free to proselyte to the limit of my capacity for the point of view expressed in my speech and intend to do so. On why he ran again, one suspects that few at the time would rush to gainsay him. But the surprise was to find Dewey, a former Republican nominee, taking issue with a scion of his party. In 1948, Stalin threatened to cut off Allied access to Berlin. Truman and Prime Minister Attlee defied him with the Berlin Airlift. In the House of Commons, a jubilant Churchill congratulated Labour with gusto.7 He even hoped for “some great common bond of union, like we had in 1940, to lead to that melting of hearts where sacrifice seems to be an indulgence and pain becomes a joy, and when life rises to its highest level because death has no terrors.”8 It was typical of Churchill’s lifelong preference for coalitions at times of crisis. Secondly, Hoover balked at helping a Europe that refused to help itself. “The test is whether they have the spiritual force, the will, and acceptance of unity among them by their own volition. America cannot create their spiritual forces; we cannot buy them with money.” But there was no hard currency in Europe except the Swiss franc. Churchill was doing his best to create unity of purpose and collaboration, but this view of Hoover was anathema to him. The situation, he thought, was desperate. With the best spiritual will and unity, he declared again and again in those years, Europe could not defend itself. It was America’s obligation to do everything to help. Otherwise, however, the Hoover and Churchill theses run parallel. Hoover like Churchill favored peace through strength. He advocated a joint naval and air strategy, a unity of minds between the United States and the British Empire and Commonwealth. That is what Churchill had worked for most of his life. 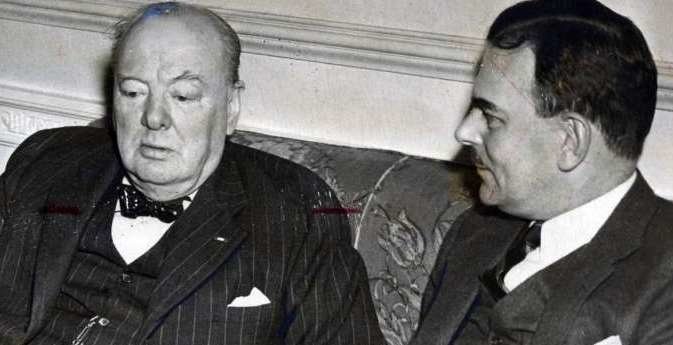 Churchill’s reply to Dewey was brief: “It is a comfort to me that you felt Hoover’s speech was ‘appalling.’ I think that your own declarations are of far more consequence.”12 After all, Hoover by 1950 was a busted flush. Truman’s vigorous policy of global defense had reassured Churchill that America would not retreat from world leadership—as he had repeatedly warned Americans they could not do. But two years later Eisenhower was elected. And the old doubts rose again. Oddly or ironically, Dewey himself now proposed a defense posture very much like Hoover’s. They met in New York in January 1953, shortly before Eisenhower took office. After a dinner hosted by Bernard Baruch, they were joined by John Foster Dulles. The latter was about to become Eisenhower’s Secretary of State. Dulles had declared, without prevarication, that he thought it would be “most unfortunate for Churchill to return to Washington in February.” He explained that the American public thought Winston could cast a spell on all American statesmen and that if he were directly associated with the economic talks, the fears of the people and of Congress would be aroused to such an extent that the success of the talks would be endangered. Winston took this very reasonable statement ill, but Christopher and I both took pains to assure Dulles afterwards that we thought he was absolutely right. Irritated by this, Winston let fly at Dewey after dinner and worked himself into a fury over certain Pacific Ocean questions. Christopher and I again applied soft soap subsequently. We told Dewey that a sharp debate was the PM’s idea of a pleasant evening and assured him that he would only have spoken thus to a man whom he trusted and looked upon as a friend. So it was that Thomas Dewey reversed himself. From the “appalling implications” he saw in Hoover’s broadcast in 1950, Dewey had proposed much of what Hoover had proposed: a Pacific-based defensive strategy. Churchill’s views on that remained consistent. He went away with grave doubts about Foster Dulles, who would confirm his misgivings by his attitude toward a Soviet summit at the Bermuda Conference with Eisenhower the following December. And that indeed is another story—one that The Churchill Documents 1951-1965 shall relate. 1 Larry P. Arnn & Martin Gilbert, eds., The Churchill Documents, vol. 22, August 1945-October 1951 (Hillsdale College Press, forthcoming). 2 See Herbert Hoover, “Our National Policies in This Crisis,” Broadcast on 20 December 1950, in Addresses Upon the American Road 1950-1955 (Stanford, Calif.: Stanford University Press, 1955), 3-10. Online at http://bit.ly/2NQXOs2. 4 WSC to Truman, 12 May 1945; Truman to WSC, 21 May 1945, ibid. 5 Winston S. Churchill, Their Finest Hour (London: Cassell, 1949), 340. 6 Churchill to Attlee and Bevin, 7 March 1946, in The Churchill Documents, vol. 22. 7 Winston S. Churchill, “Foreign Affairs,” House of Commons, 10 December 1948, in The Churchill Documents, vol. 22. 8 Churchill, speech at Leeds, 4 February 1950, in The Churchill Documents, vol. 22. 9 Hoover, “Our National Policies,” 4. 11 Winston S. Churchill, Zurich, 19 September 1946, in Richard M. Langworth, ed., Churchill By Himself (London: Ebury Press, 2012), 315. 12 Churchill to Thomas Dewey, 30 January 1951, in The Churchill Documents, vol. 22. 13 Martin Gilbert, Winston S. Churchill, vol. 8, Never Despair 1945-1965 (Hillsdale, Mich.: Hillsdale College Press, 2013), 791. 14 John Colville, The Fringes of Power: Downing Street Diaries 1940-1955, 2 vols. Sevenoaks, Kent: Sceptre Publishing, 1986-87, II 320. 15 Gilbert, Never Despair, 791.